Weather Summary: A strong upper-level ridge of high pressure dominated the nationâ€™s weather this U.S. Drought Monitor (USDM) week, bringing well above-normal temperatures to the central and northern tier states. Clouds with scattered showers and thunderstorms along a stalled cool front kept temperatures below-normal in the southern states. But even then, maximum temperatures were 90 degrees F or warmer across much of the country, with maximums exceeding 100 from South Dakota to Kansas. Philip, South Dakota, reached 109 degrees on July 15. Beneficial rain fell from southern Texas to the southern Appalachians along the front. Excessive rainfall occurred over southeast Texas where amounts totaled 10 inches or more in places, but elsewhere rainfall amounts were generally localized with limited relief. Monsoon showers and thunderstorms brought above-normal rain to parts of the West, but the rain had little impact on deficits which have accumulated over several months. Weak fronts triggered localized showers and thunderstorms along the northern tier states. In between, hot and dry weather dominated from the central Plains to Ohio Valley, Great Lakes, and Northeast. Another week of hot and dry weather continued the deterioration of crop conditions in Americaâ€™s breadbasket. U.S. Department of Agriculture (USDA) reports for the week ending July 15 indicated that 38 percent of the nationâ€™s corn crop was in poor to very poor condition, compared to 30 percent a week ago, and 30 percent of soybeans were in poor to very poor condition (compared to 27 percent last week). Fifty-four percent of the nationâ€™s pasture and rangeland was in poor to very poor condition, which is a jump of 4 percent compared to last week and is an all-time high for the 1995-2012 growing season weekly history. About two dozen large wildfires, mostly in the West, were burning on July 17, about half the number compared to a week ago. Streamflows were in the lower tenth percentile of record, or at record low values at several time scales, across much of the Midwest and parts of the central Plains, West, Southeast, and even parts of New England. As a result, the impacts boundaries were shifted to reflect short-term and long-term drought conditions from the west coast to Ohio Valley and Southeast, with short-term conditions indicated in the northern tier states and from eastern Tennessee to New England. Long-term impacts were indicated for parts of the Southwest and central Gulf of Mexico states. WALTONVILLE, Ill. â€” The nation's widest drought in decades is spreading, with more than half of the continental United States now in some stage of drought and most of the rest enduring abnormally dry conditions. Only in the 1930s and the 1950s has a drought covered more land, according to federal figures released Monday. So far, there's little risk of a Dust Bowl-type catastrophe, but crop losses could mount if rain doesn't come soon. In its monthly drought report, the National Climatic Data Center in Asheville, N.C., announced that 55 percent of the country was in a moderate to extreme drought at the end of June. The parched conditions expanded last month in the West, the Great Plains and the Midwest, fueled by the 14th warmest and 10th driest June on record, the report said. Topsoil has turned dry while "crops, pastures and rangeland have deteriorated at a rate rarely seen in the last 18 years," the report said. The percentage of affected land is the largest since December 1956, when 58 percent of the country was covered by drought, and it rivals even some years in the Dust Bowl era of the 1930s, though experts point out that this year's weather has been milder than that period, and farming practices have been vastly improved since then. Midday weather updates indicate extreme heat and drought conditions were set to continue baking already scorched corn and soybean crops in America's breadbasket through early August. "It's the same old general theme, dry in the southwest Corn Belt and some showers in the north and east," said Drew Lerner, meteorologist for World Weather. The most expansive drought in over a half century was drying up waterways and beginning to slow down river shipments of commodities to U.S. Gulf export ports and was leading to fresh cuts in estimates for this year's corn production. Further damage is expected to corn and soybean crops that already have been nearly decimated in some Midwest areas, an agricultural meteorologist said on Friday. "It will be dry and very hot in the area with temperatures in the 100s (degrees Fahrenheit) in St. Louis Sunday through Thursday, reaching 106 F on Wednesday," said Don Keeney, meteorologist for MDA EarthSat Weather. The same scenario is expected for much of the central and western Midwest. Beginning in the eastern and southern Midwest, the drought has spread to the central and western areas of the region, including the top two corn producing states, Iowa and Illinois. Safeway Inc. said Thursday that its net income fell 16 percent in the second quarter, as the grocery store operator spent more on advertising and rolled out a new loyalty program to stave off growing competition. The Pleasanton, Calif.-based company says expenses related to the program's launch â€” along with its repurchase of company stock â€” offset a modest bump in sales and market share. Going forward, Safeway is betting that the "just for U" program, which offers personalized deals based on past purchases, will help build customer loyalty. In a conference call with investors, CEO Steve Burd noted that the program will also let Safeway more nimbly fend off competitors by tracking customer buying patterns. Making matters worse, supermarkets are facing rising costs to keep their shelves stocked as a result of higher prices for corn, fuel and other commodities. But they're afraid to pass on those costs, lest customers decide to shop elsewhere. Instead, Safeway and other grocers are looking to control costs by expanding and improving the image of their store-label products. Unique, higher-quality store-brand products also help boost loyalty. The company spent $240.4 million during the quarter to repurchase 11.6 million of its shares. Total sales for the period rose 2 percent to $10.39 billion, which also topped Wall Street expectations. Sales from stores open at least a year edged up 0.8 percent, when excluding fuel costs. The metric is a key gauge of health, because it strips out the impact of newly opened and closed stores. For the year, the company expects to spend about $900 million on capital expenditures, such as the opening about 10 new Lifestyle stores and the remodeling of another 10. Safeway stood by its full-year guidance of $1.90 to $2.10 per share. Safeway operates about 1,700 stores in North America under names including Vons in Southern California and Nevada and Randalls in Texas. For instance, I went in the other day to Safeway---$1.69 a pound for California Valencia Oranges. Another store sold me 5 lbs of valencia oranges for $3.69 for the entire bag---around 74 cents a pound. Of course the Global Warming acolytes will cry that we have brought this on ourselves and are being punished by Gaia. A closer look at long term historical and paleoclimatic records show us that for thousands of years the continental United States has regularly experienced periods of drought. I live in Australia and over the last 3 years we suffered a substantial drought. The climate fanatics pulled their hair and wrung their hands. During this drought water restrictions were enacted and legislated to the point where there are many regions that now have PERMANENT water restrictions! The drought broke last year and we are now experiencing record rains, floods and land slides. Yet the water restrictions remain in place. Water will be the CO2 of the near future. Controlled and commodified and traded to "protect" us. Once again a natural resource, that every human being shoud have a natural right to, will be restricted. The impact of droughts over the last few decades have shown that some regions and sectors of the population are becoming increasingly vulnerable to drought. Compounding these vulnerabilities is the uncertainty of the effects of human activities and global warming on climate in general and on drought in particular. A number of climate model simulations for doubled CO2 conditions suggest an increased frequency of drought in midcontinental regions (e.g. Gregory et al, 1997 , Mearns et al, 2000) whereas other model simulations and recent decadal trends in the instrumental record suggest wetter conditions, at least in the short term, due to an intensification of the hydrologic cycle associated with warmer sea surface temperatures. Better constrained answers to the question of the severity of future droughts requires improved understanding and modeling of the processes underlying the drought behavior exhibited in both the instrumental and the paleoclimate records. The graphic [above] illustrates four regional droughts. Each graph shows the variations in the instrumental Palmer Drought Severity Index (PDSI) from 1895-1995 for each of the four regions; northern California, eastern New York, northwestern Texas, and north-central Nebraska (graphs are based on a grid point within each region). The accompanying maps show the spatial pattern of drought for key drought years. Each drought in the 20th century has a unique signature. The timing and evolution of droughts, and the areas impacted are variable, making it difficult to understand just what causes drought onset and persistence. Although the central High Plains appears to be the region most often affected by the most persistent droughts, the southern Plains, and parts of Texas in particular, appear to suffer from the highest frequency of drought. However, evidence from the instrumental record indicates that drought can affect any region of the U.S. The Dust Bowl drought was a natural disaster that severely affected much of the United States during the 1930s. The drought came in three waves, 1934, 1936, and 1939-40, but some regions of the High Plains experienced drought conditions for as many as eight years. The "dust bowl" effect was caused by sustained drought conditions compounded by years of landPhotos from Library of Congress and U.S. National Archives management practices that left topsoil susceptible to the forces of the wind. The soil, depleted of moisture, was lifted by the wind into great clouds of dust and sand which were so thick they concealed the sun for several days at a time. They were referred to as" black blizzards". During the 1950s, the Great Plains and the southwestern U.S. withstood a five-year drought, and in three of these years, drought conditions stretched coast to coast. The drought was first felt in the southwestern U.S. in 1950 and spread to Oklahoma, Kansas and Nebraska by 1953. By 1954, the drought encompassed a ten-state area reaching from the mid-west to the Great Plains, and southward into New Mexico. The area from the Texas panhandle to central and eastern Colorado, western Kansas and central Nebraska experienced severe drought conditions. The drought maintained a stronghold in the Great Plains, reaching a peak in 1956. The drought subsided in most areas with the spring rains of 1957. The three-year drought of the late 1980s (1987-1989) covered 36% of the United States at its peak. Compared to the Dust Bowl drought, which covered 70% during its worst year, this does not seem significant. However, the 1980s drought was not only the costliest in U.S. history, but also the most expensive natural disaster of any kind to affect the U.S.
Coincident droughts, or the same droughts, are apparent in tree-ring records from Mexico to British Columbia, and from California to the East Coast (See examples in the graph to the right). Winter and spring drought conditions appear to have been particularly severe in the Southwestern U.S. and northwestern Mexico, where this drought appears to have lasted several decades. In other areas, drought conditions were milder, suggesting drought impacts may have been tempered by seasonal variations. ST. LOUIS (AP) â€” Nearly 220 counties in a dozen drought-stricken states were added Wednesday to the U.S. government's list of natural disaster areas as the nation's agriculture chief unveiled new help for frustrated, cash-strapped farmers and ranchers grappling with extreme dryness and heat. The U.S. Department of Agriculture's addition of the 218 counties means that more than half of all U.S. counties â€” 1,584 in 32 states â€” have been designated primary disaster areas this growing season, the vast majority of them mired in a drought that's considered the worst in decades. The Drought of 2012 will have wide-ranging consequences, from the prices at your local bakery now to the meat you buy for grilling next summer, says the economist in charge of the Omaha branch of the Federal Reserve Bank of Kansas City, Mo. With 1,300 counties called disaster areas, two-thirds of U.S. corn, soybean and livestock production is sweltering in drought conditions. Predictions this spring of a bumper crop have shriveled to a 12 percent decline for corn and an 8 percent drop for soybeans. Estimates are steadily falling. Surprisingly, overall U.S. crop income could match last year's record because surviving crops will bring high prices. Farmers who lose crops to the drought could collect as much as $300 per acre from crop insurance, and most farmers bought at least some insurance. But many farmers will have big losses; high grain prices don't help if you have nothing to harvest. Supermarket prices for beef and pork are falling as farmers sell off herds rather than buy expensive grain for feed or rely on dried-up pastures. The glut of animals headed for slaughter has cut prices paid for cattle by 12 percent. Because of sustained high temperatures, consumers are buying less meat to cook outdoors, pushing down prices for beef and pork and cutting meatpackers' profits. Next year, however, meat prices likely will climb by 8 percent or more because there will be fewer cattle and hogs. As beef and pork prices rise, they buy more hamburger and less steak, choose cheaper restaurants, order lower-priced items from the menu, skip dessert and, if high prices persist, cut back other spending as well. The price crunch will hurt low-income families the most because they spend a larger share of income on food. High corn prices sparked by the drought are leading to renewed calls for an end to the ethanol mandate. NEW YORK (CNNMoney) -- The drought that's killing crops across the Midwest and sending corn prices to record highs has revived calls to end or ease the government's requirement that corn-based ethanol be blended with gasoline. Current rules stipulate that nearly 10% of the nation's gasoline supply come from corn-based ethanol. To make that ethanol, up to 40% of the country's annual corn production can be required. With corn prices surging -- they're up 50% in the last six weeks alone -- many say waiving the mandate would help bring those prices down. They say lower corn prices would also help lower prices for certain foods that depend on the crop, like cereal and meat. "The impact this is having on the animal protein industry and at the dinner table is profound," Arkansas Republican Congressman Steve Womack said in a statement last week. "If something isn't done -- and done fast -- food prices will soar." Womack and 150 other lawmakers from both parties sent a letter to Environmental Protection Agency head Lisa Jackson last week asking her to ease the ethanol mandate. The Mighty Mississippi to Run Dry? If the worldâ€™s largest navigable river system goes dry, the economic consequences will be felt around the world. What is the single greatest reason America is so wealthy? According to the analysts at Stratfor, it is because of a river. They have to be joking, right? What about Americaâ€™s vast gold resources? What about its mountains of coal? America is the worldâ€™s third-largest oil producerâ€”surely that is why. Then there is Americaâ€™s temperate climate and fertile soils that traditionally make it the worldâ€™s breadbasket. And donâ€™t forget Americaâ€™s human capital, Yankee ingenuity, and Protestant work ethic. Surely these factors are cumulatively more important than a river. Not according to one of Americaâ€™s premier think tanks. Many countries have large natural resources and hospitable climates, but donâ€™t even come close to having Americaâ€™s wealth. What sets America apart from the rest of the world is the Mississippi River basin. It is what makes exploiting Americaâ€™s resources economically possible. But now, due to the worst drought since the 1950s, the Mississippi may be about to go dry. In Memphis and Vicksburg, the shrinking river is obvious: slower river, exposed river banks, and more sandbars. The water is down more than 13 and 20 feet in each city respectively. The Mississippi on average is about 13 feet below normalâ€”and a whopping 55 feet below where it was at this time last year. On some stretches, the water level is perilously low. On July 17 it was reported that a 100-mile stretch of the Platte River in Nebraska, had dried up. In fact, water levels are now so low that barge operators are no longer able to operate at full capacity and have to shed both weight and number of towed barges. For each one-inch loss of water, the standard barge must unload 17 tons of cargoâ€”that is a loss of 204 tons, per barge, for every one-foot loss. A typical tow on the upper Mississippi river may have 15 barges. A one-foot loss of water translates into a loss of 3,000 tons of capacity. Tows on the lower Mississippi River may have up to 45 barges, resulting in a loss of capacity of over 9,000 tons. Tom Allegretti, president of the American Waterways Operators, reports that it would take 130 semitrucks or 570 rail cars to haul the freight unloaded by one large barge grouping under those conditionsâ€”almost 600 rail cars just to make up for the loss of one string of barges! There are thousands and thousands of barge strings that ply the Mississippi each year. The shutdown of the Mississippi would be an absolute catastrophe! Already, the cost to ship bulk goods is rising. As the weight that can be put on barges shrinks, the cost per unit weight is rising. And that translates into higher costs on the consumersâ€™ end. Products that are already only marginally profitable may not be economic at these higher transport costs. The last time the Mississippi shut down due to low water was in 1988. Then just a small section of the river became unnavigableâ€”but it cost the shipping industry $1 billion. As you read this, the United States is experiencing the worst drought it has seen since the Dust Bowl days of the 1930s. As you read this, nearly half of all corn crops in the United States are in "poor" or "very poor" condition. As you read this, 38 major wildfires are ripping across the central and western United States. The brutal wildfires in Oklahoma have been so bad that they have made national headlines. The price of corn has hit a brand new record high this summer and so has the price of soybeans. More than half of all the counties in this country have been declared to be "natural disaster areas" by the U.S. Department of Agriculture at this point. Things are so bad for ranchers that the CEO of Smithfield Foods is projecting that meat prices will rise by "significant double digits" in the months ahead. 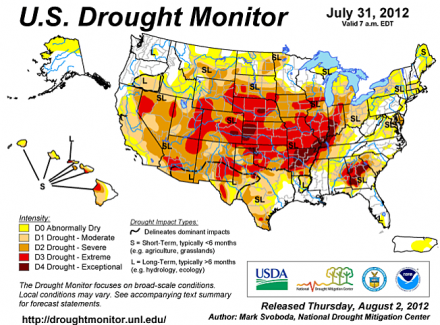 Sadly, this drought is projected to continue throughout August and into September. As you will read about below, some meteorologists are even openly postulating that there may not be enough moisture to avoid another drought next year. Yes, things are really bad this year, but when you step back and take a look at the broader picture they become truly frightening. 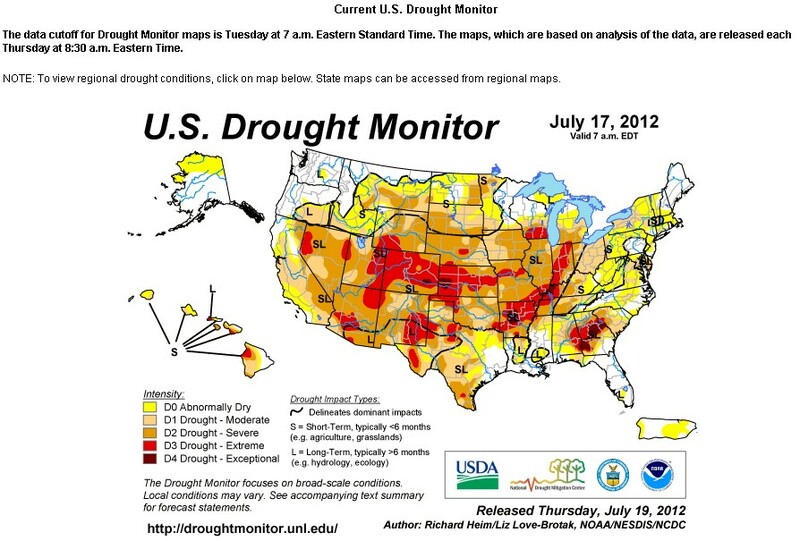 Keep in mind that brown is "severe drought", red is "extreme drought" and dark brown in "exceptional drought". "Over 90 percent of the topsoil was short or very short of moisture in Oklahoma, Kansas, Nebraska, Missouri, Iowa, Illinois, Indiana, and Ohio, with virtually all (99 percent) short or very short in Missouri and Illinois"
At this point, close to half of all corn being grown in the U.S. is either in "poor" or "very poor" condition. Nearly three-quarters of the nation's cattle acreage is now inside a drought-stricken area, as is about two-thirds of the country's hay acreage, the agency reported. He also told the Financial Times that he expects meat prices to rise by "significant double digits". The CEO of a major food company says that beef is going to "be too expensive to eat"? That doesn't sound good at all. "When I was a kid in the '50s ... it got real dry, but nothing like this," said Marvin Helms, a 70-year-old farmer and rancher in central Arkansas who was compelled to sell his beef cattle after being short on feed. "We've got some insurance on the crops, but it's not enough," he said. "It will help, but it won't pay the bills." Another major change that we have seen is that massive dust storms called "haboobs" are becoming much more frequent in the southwest part of the country. Although the final ranking of this past July will not be released by the NCDC until around August 7th, it would appear that the month will almost certainly rank in the top five warmest Julyâ€™s on record since official records began in 1895 (and perhaps even in the top three). Here is a summary of some of the more notable records set so far this summer. In addition, I have included a brief message concerning a potential new heat record for the continent of Asia. Preliminary data from the NCDC reports that 4,313 record daily highs, 293 monthly record highs, and 171 all-time record highs were observed this past July (among the approximately 5,500 various official weather sites across the nation). Many of these sites, however, have limited periods of record that do not extend back to the 1930s when the countryâ€™s greatest heat waves occurred. Perhaps what is truly astonishing is that this July (2012) piggybacks upon the equally torrid summer (and July) of 2011. Although, back-to-back record-breaking hot summers are not unheard of (summers in the 1930s and 1950s come to mind) it is nevertheless disconcerting. This table shows the number of cities (out of 298 in all) that recorded their respective single-warmest month on record and absolute maximum temperature on record for the June-July month timeframes in 2012, 2011, and 1936. As the eastern two-thirds of the United States continues to swelter under some of the hottest temperatures seen in recent years I thought it opportune to look back at the nationâ€™s worst heat wave and hottest summer in history, that of 1936. The climatological summer (June-August) of 1936 was the warmest nationwide on record (since 1895) with an average temperature of 74.6Â° (2nd warmest summer was that of 2006 with an average of 74.4Â°) and July of 1936 was the single warmest month ever measured with an average of 77.4Â° (beating out July 2006 by .1Â°). Ironically, February of 1936 was the coldest such on record with an average nationwide temperature of 26.0Â° (single coldest month on record was January 1977 with a 23.6Â° average). In February of 1936 temperatures fell as low as -60Â° in North Dakota, an all-time state record and Turtle Lake, North Dakota averaged -19.4Â° for the entire month, the coldest average monthly temperature ever recorded in the United States outside of Alaska. One town in North Dakota, Langdon, went for 41 consecutive days below zero (from January 11 to February 20), the longest stretch of below zero (including maximum temperatures) ever endured at any site in the lower 48. With this in mind, it is truly astonishing what occurred the following summer. The temperature in North Dakota that had reached -60Â° on February 15 at Parshall rose to 121Â° at Steele by July 6, 1936. The two towns are just 110 miles from one another! June of 1936 saw unusual heat build initially in two nodes, one centered over the Southeast and another over the Rocky Mountains and western Plains. This differs from the current heat wave that began mostly over Texas and the Deep South. Tennessee (110Â° at Etowah on June 29th, 1936). A total of 8 states and all these monthly records are still standing. By July the dome of heat locked in place over the central and northern Great Plains and remained there for the entire month. Add to the above list a 120Â° reading at Gann Valley, South Dakota on July 5th. Unfortunately I am unable to update the table with this record since it would involve rewriting and posting the table (not an easy task!). Sorry for the omission! On July 15th the average high temperature for all 113 weather stations in Iowa measured 108.7Â°. Similar to the current heat wave the nighttime low temperatures were also remarkably warm. Bismarck recorded a low of just 83Â° on July 11th. Milwaukee, Wisconsin endured five consecutive nights above 80Â° from July 8-13. Even near the normally cool shores of Lake Erie amazing temperatures were recorded such as the low of 85Â° and high of 110Â° at Corry, Pennsylvania on July 14th. And most amazing of all was the low of 91Â° at Lincoln, Nebraska on the night of July 24-25th warming to an all-time record of 115Â° on the 25th. What I really find interesting about this is the direct comparison to the 1930's depression and dust bowl drought. In 1930 a drought began which coincided with the depression. It continued for ten years and did not abate until 1940 (the end of the depression and beginning of WWII. Now here we are in a depression for years which they call a recession, like children take recess at school, and a building drought has finally broken thru. Back in 2008 there were predictions of a major wheat crop failure that never materialized. The parallels are hard to deny. Corn surged to a record, leading rallies in soybeans and wheat, on mounting signs that the worst U.S. drought since 1956 will erode production from farmers that are the worldâ€™s largest exporters of the crops. The U.S. Department of Agriculture, in a report tomorrow, probably will cut its domestic corn-crop forecast to 10.929 billion bushels, the smallest in six years, according to the average estimate of 29 analysts in a Bloomberg survey. That would be down 16 percent from a July forecast, the biggest August reduction since 1974. The estimate for soybeans may drop 8.3 percent to 2.796 billion bushels, the smallest since 2007. Corn prices through yesterday were up 61 percent since mid- June and soybeans rallied 20 percent, while the government rated the condition of the U.S. crop on Aug. 3 as the worst since 1988. Output threats are being compounded by dry weather in Russia and below-average monsoon rains in India. Goldman Sachs Group Inc. is among the banks forecasting prices will keep rising, and the United Nations reported today the biggest gain in global food costs since 2009. Stockpiles of the biggest crops will decline for a third year as drought parches fields across three continents, raising food-import costs already forecast by the United Nations to reach a near-record $USUS1.24 trillion ($US1.18 trillion). Combined inventories of corn, wheat, soybeans and rice will drop 1.8 per cent to a four-year low before harvests in 2013, the US Department of Agriculture estimates. Crops in the US, the biggest exporter, are in the worst condition since 1988, heat waves are battering European crops and India's monsoon rainfall already is 20 per cent below normal. The International Grains Council began July by forecasting record harvests. It ended with a prediction for a 2 per cent drop in output. The speed of the destruction drove corn and soybean prices to records last month and wheat to a four-year high. For investors, crops are the best-performing commodities this year, and Goldman Sachs, Macquarie Group and Credit Suisse say the trend will continue. The UN expects food costs to rise, less than two years after record prices pushed 44 million people into extreme poverty and contributed to uprisings in North Africa and the Middle East. Monsanto drought tolerant crops. Yummmmmmmmm. 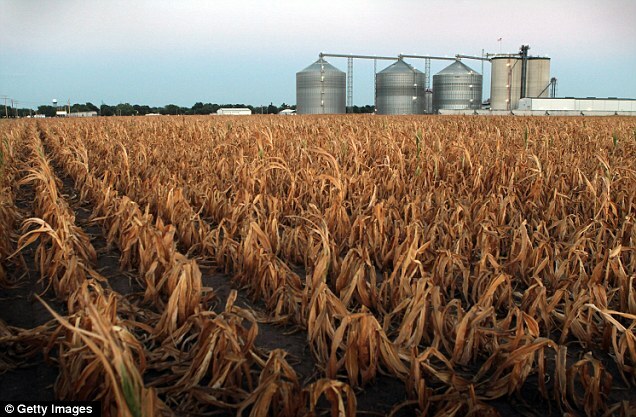 This year's corn and soybean crops have been clobbered by heat and lack of rain. The Agriculture Department's Crop Production Report said the U.S. corn crop would be 13 percent smaller than the amount harvested in 2011, the smallest crop since 2006. The soybean crop would be 12 percent lower than last year and the smallest crop since 2003. The report predicts that Iowa will harvest 1.9 billion bushels of corn, an 18 percent decline from 2011, and Nebraska will harvest 1.3 billion bushels, a 13 percent smaller crop than 2011. Both states fared better than eastern Corn Belt states, however. Indiana's crop is expected to be 28 percent smaller than last year and Illinois' forecast is for a 25 percent smaller crop. The magnitude of the loss is intensified because farmers planted more acres to corn this year and, at the start of the season, forecasters had predicted a possible record crop. While in Louisiana our rain fall has been above or at average because of the drought in the rest of the country the Mississippi is "running backwards". The Gulf of Mexico is intruding up the mouth of the River and in Plaquimines parish, where the River dumps in to the Gulf they have been forced to shut off the water system, that extracts water from the river to give it to the residents because of salinity and have had to pipe in water from two neighboring parishes. Food prices are expected to surge after the worst drought in the U.S. for half a century destroyed one-sixth of the country's expected corn crop over the past month. The hottest July in U.S. history has caused irreparable damage to crops, forcing corn farmers to abandon fields greater in area than Belgium and Luxembourg. Soybeans, which are used for animal feed and to make vegetable oil, have also been affected, with this harvest likely to be the worst for five years. The crisis has prompted the US Department of Agriculture (USDA) to forecast record-breaking price rises, and some of the world's largest food manufacturers, including Kraft, Tyson and Nestle, have already indicated that they will pass on the increase to consumers. As prices rise, tempers fray. The US drought has pushed up global food prices and is likely to continue to do so. Some say riots and unrest may follow. According to the Climate Prediction Center, part of the National Oceanic and Atmospheric Administration, El NiÃ±o conditions are likely to develop over the Pacific in August or September, which should affect global weather before the end of the year. This may drive food prices up further if it causes floods or further drought. US farms are already crippled: the Department of Agriculture says the corn (maize) crop is likely to be the worst since 1995. As a result, the Food Price Index (FPI) of the United Nations Food and Agriculture Organization rose 6 per cent in July, to 213. This worldwide drought will create millions of deaths due to starvation. It's a sad situation. Boats are having a tough time making it down the "Mighty Mississippi," as the river's water levels drop to historic lows. It's bad for business, since the river is one of the country's most important waterways for shipping cargo. Right now, sending goods down the river is moving at a snail's pace. The low water levels are causing many boats to get stuck, even in the middle of the river. It's forcing some barges to stop travel all together and others to significantly reduce their weight. Even the famous "American Queen" steamboat can't make it down the river. Just a few days ago it got stuck near Memphis, forcing all 300 passengers off the boat. With less boats and less goods making it down the river, it's driving up the cost of shipping and creating longer waits for products at grocery stores across the country. Some say the river could be on the brink of closing down. If it does, that would cost the U.S. about $300 million a day. And according to the man-made global warming cult, plant food (aka C02) is the cause of all this. And since plant food is the cause, only a global tax on plant food can possibly save us. PITTSBURGH â€” In a surprising turnaround, the amount of carbon dioxide being released into the atmosphere in the U.S. has fallen dramatically to its lowest level in 20 years, and government officials say the biggest reason is that cheap and plentiful natural gas has led many power plant operators to switch from dirtier-burning coal. It's time for me to dust off my copy of John Steinbeck's book, Grapes of Wrath. related: Is The U.S. Government Stockpiling Food In Anticipation Of A Major Economic Crisis? Based on newspaper reports such as these, it would appear that the current situation in California is as bad, if not worse, than anywhere else in the nation. The situation is so bleak that at least one dairy cooperative has launched a crisis hotline for dairy farmers and their families, according to this article in The Fresno Bee. The hotline provides members with confidential counseling and support services to help those in the industry cope with life-altering changes. â€œDairymen are getting out of the business â€” sending their cows to slaughter as fast as they can,â€� said Barcellos, owner of a dairy farm that goes back generations. Riley Walter, a Fresno-area bankruptcy attorney, noted that the dramatic increase in bankruptcies among dairies is staggering. "This is just a bloodbath," he told John Lindt, publisher of the Sierra2thesea News Service, whose article appeared in the Visalia Times-Delta. During the Great Depression of the 1930s, agricultural price support programs led to vast amounts of food being deliberately destroyed at a time when malnutrition was a serious problem in the United States and hunger marches were taking place in cities across the country. For example, the federal government bought 6 million hogs in 1933 alone and destroyed them. Huge amounts of farm produce were plowed under, in order to keep it off the market and maintain prices at the officially fixed level, and vast amounts of milk were poured down the sewers for the same reason. The government did stupid things then and still does stupid things. Some things never change. Not stupid, deliberately evil. I bet all that food Soetoro announced the govt bought recently to "help the corn producers" was also destroyed. Monsantoâ€™s drought tolerance biotechnology trait is designed to provide yield stability to help farmers manage their risk when water is limited. (5) Collect Billions of Dollars. They do not care about the money as they create it out of thin air. They truly want us dead, the money is just a game they use to keep us distracted. They could care less about how they kill us off, as long as we keep fighting each other and not them. Corn damaged by severe drought rots on a farm near Bruceville, Indiana, on August 16. US corn and soybean prices closed at new record highs Tuesday as a new survey showed worse-than-expected crop damage from a brutal drought across the country's central breadbasket. Rows of corn severely damaged by widespread drought is left standing on August 16 for insurance adjusters to evaluate after the rest of the field was removed on a farm near Bruceville, Indiana. US corn and soybean prices closed at new record highs Tuesday as a new survey showed worse-than-expected crop damage from a brutal drought across the country's central breadbasket. AFP - US corn and soybean prices closed at new record highs Tuesday as a new survey showed worse-than-expected crop damage from a brutal drought across the country's central breadbasket. The price of corn jumped 1.7 percent to $8.3875 a bushel, while soybeans finished at $17.3025 a bushel, up 2.8 percent from Tuesday. That left the corn price up 68 percent from June and soybeans 39 percent higher. An all-time record hot July accompanied by nearly three months of extreme drought have baked the country's prime farmland in the midwestern and central states, where the world's largest corn and soybean crops are grown. Prices jumped after reports from the annual Pro Farmer Midwest Tour gave analysts and traders more bad news on the state of the crops. "Crops in western Ohio and eastern Indiana were far below the norm," said Pro Farmer analyst Brian Grete. Yields in South Dakota meanwhile were called "stunningly low." The drought has made 2012 a tough year for farmers in the Tri-States, but fruit and vegetables growers are facing their own share of challenges. In fact, at the Farmer's Market at Washington Park in Quincy, one couple says that after planting 450 tomato plants, only half of them produced. "I don't remember ever seeing it this bad," Sharron Parrish said. Parrish has been growing fruits and vegetables since she was a child, but despite the hard work she put into their garden this year, Mother Nature had its own plan. "About 50 percent of it we lost. We emptied three wells trying to irrigate, but some of the stuff never even came up," Parrish said. Apple orchard owners are facing a similar problem. While some types of apples turned out fine, others are in short supply. "The gala crop was short and we're already running low on them.That was one of the few that was impacted quite a bit. We expect to be somewhat short on Jonagold," Jim Zellerman, co-owner at Edgewood Orchards said. Zellerman said his apple crop at Edgewood Orchards ripened two weeks early, impacted not only by this summer's hot, dry weather, but by freezes in the spring. The worst U.S. drought in more than half a century helped drive down rates for Panamax vessels shipping grains to the lowest in more than 3 1/2 years as it results in a slump in cereal cargoes. The ships hauling about 60,000 metric tons of grains and other commodities including coal and iron ore slid 5.7 percent to $5,141 a day, the lowest since January 2009, according to data from the Baltic Exchange in London today. The Baltic Dry Index, a wider measure of costs, fell 1.3 percent to 684 points. (Reuters) - World food prices stabilized in August at levels close to those reached in the food crisis of 2008, and global grain stocks are likely to shrink this year as cereal crop output falls short of what is needed, the United Nations food agency said on Thursday. FAO Director General Jose Graziano da Silva called for international action to calm markets but also said the August price index, which remained unchanged from July, provided some cause for optimism. Earlier on Thursday, Russian Deputy Agriculture Minister Ilya Shestakov said G20 countries would hold a meeting on the grain market next month. The worst U.S. drought in more than half a century and poor crops from the Black Sea bread basket have sent grain prices to record peaks, raising alarm over a potential repeat of the crisis in 2008 that sparked riots around the world.